Synopsis: DREW FERRAN, THE RIGHTFUL KING OF WESTLAND, IS TRAPPED.Enslaved by the Goatlord Kesslar, young werewolf Drew finds himself on the volcanic isle of Scoria, forced to fight in the arena for the Lizardlords. With the help of an unlikely ally, he must find a way to break free - but who has ever managed to escape?Meanwhile, Hector the Wereboar flees the forces of the Catlords. Now on board the pirate ship Maelstrom, the enemy's net is closing in. Haunted by the spirits of the dead, Hector is soon left wondering who the true enemy is . . .Book three in the Wereworld fantasy-adventure series from Curtis Jobling, the award-winning designer of Bob the Builder. Wereworld: Rise of the Wolf was shortlisted for the 2011 Waterstone's Children's Book Prize.Perfect for fans of Christopher Paolini's Eragon, Eldest, Brisingr and Inheritance books. Curtis Jobling, it seems, is constantly writing- proven by the fact that the third instalment in his Wereworld series is being published a mere twelve months after the series debuted on the market, offering an alternative to the somewhat archetypal high-fantasy novels that feature dragons, elves and magic. Wereworld: Shadow of the Hawk sees the introduction of many fresh faces, including an assortment of exotic therianthropes (that is, ruling were-creatures) as well as “normal” humans- Drew’s brother, Trent Ferran being just one of many. Jobling takes the risk of alienating the reader in favour of providing a rich and colossal back-drop to his story. Luckily, this gambit pays off, and though there are moments of confusion, these are brief and the benefits of having such a vast cast far outnumbers the weaknesses. This is in part due to the fact that Jobling blesses each character with their own personality: and though there is little time to dig deep into the thoughts and feelings of each and everyone, there is plenty enough to distinguish them and bring everyone- including those that are quickly dropped from the plot- to life. After the relatively calm and linear plots of Rise of the Wolf and Rage of Lions, Shadow of the Hawk really ramps up the series in terms of story. Things are really starting to move in Lyssia as more and more therianthropes join the fray and pick sides. And those characters we thought we knew- well, not all of them are quite the same, and there is an air of betrayal that permeates Shadow of the Hawk which only helps to make things even more exciting than they were previously. It is hard to be niche in the high-fantasy market, but Jobling has found his little spot- somewhere in between the epics such as The Belgariad and The Chronicles of the Icemark. Wereworld‘s greatest strength lies in its concept of upper-class, ruling were-creatures as well as its lack (or sidelined) use of common magic which differentiates it from most modern fantasies. 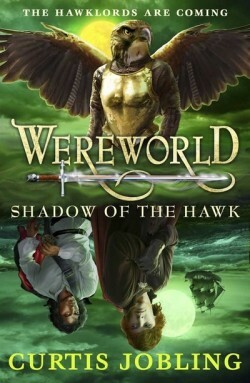 Shadow of the Hawk is an entertaining and exciting followup to the previous two Wereworld novels, offering more than just a mere fantasy quest.